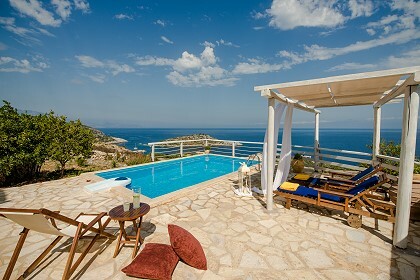 Akemi Luxury Residence is a majestic villa with a wonderful swimming pool and a view of the Ionian Sea. 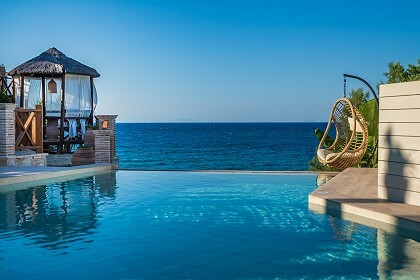 Akemi Luxury Residence is the perfect combination of comfort, spectacular luxury and unique design, and is bound to offer you the most amazing holiday experience. Akemi Luxury Residence is perfect for families or groups of friends, as it can sleep up to 8 guests in its modernly designed spaces. 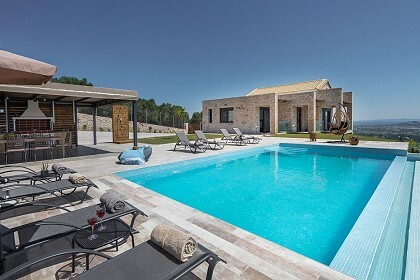 Entering the villa from its main entrance on the ground floor, the guests will find the fully equipped kitchen, a tastefully furnished dining area, as well as a spacious living room with a fireplace. On the same level, one can find a bedroom and a patio as well. Three more bedrooms are located on the first floor – and one of them features an en-suite bathroom. Additionally, there is another bathroom and an interior balcony with an office. 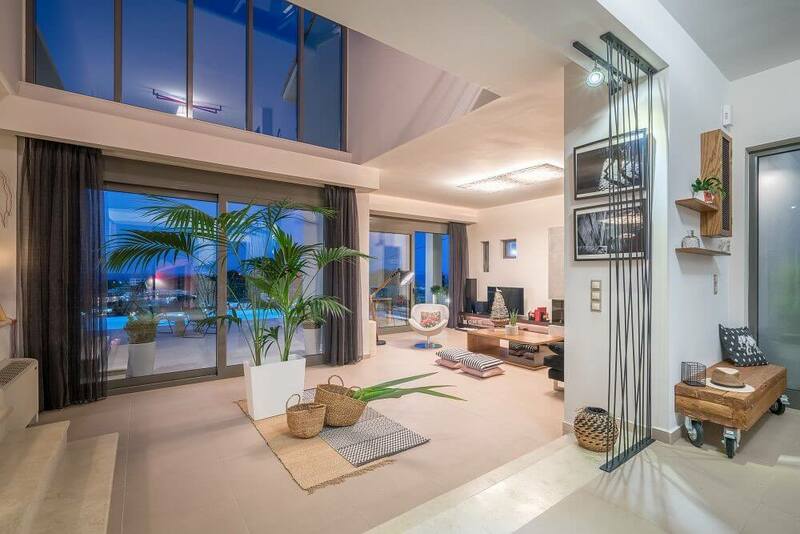 The villa’s basement contains a fitness studio and an additional bathroom, while the guests will find a lounge area in the attic. 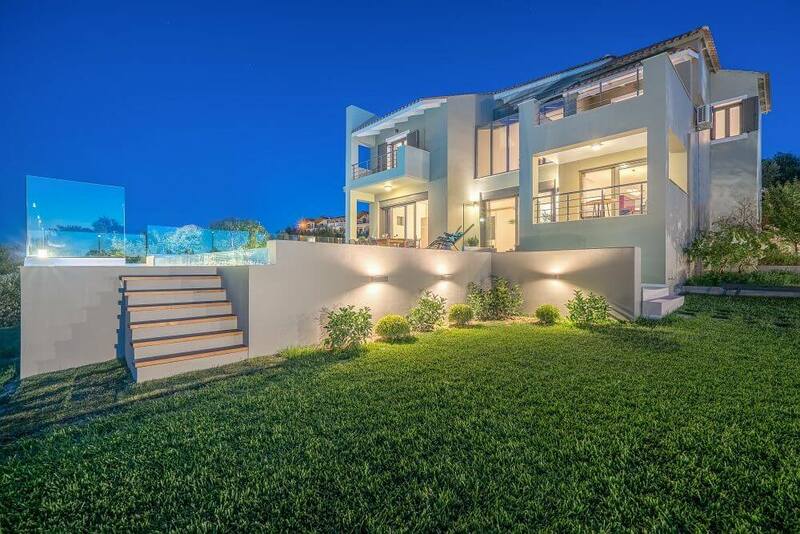 Naturally, the description is never complete until we mention the breathtaking outdoor spaces, which feature an infinity pool, landscaped gardens and an unmatched view of the Ionian Sea! more. Other extra services such as car, motorcycle and bicycle rentals and boat trips, can be arranged upon request. Akemi Luxury Residence is located near the popular resort of Tsilivi. 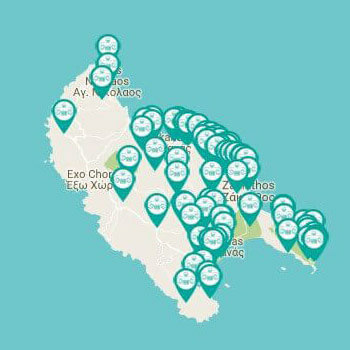 The island’s capital, Zante Town, is 6.6 km away, and the Zakynthos International Airport is only 11 km away. The Tsilivi area has everything a traveler may require, from a sandy beach to a multitude of restaurants and bars. Tsilivi Water Park, is a short drive away and is an entertaining water park ideal for families. At last (but certainly not least, as you will see!) the Tsilivi Beach; which has blue shallow waters and is awarded with a blue flag, just 850m away!